Trap the dribbler and go over the screen. Hard show and go over. Pinch, squeeze, or push up and under or through. Trap and aggressively switch the rescreen. Stop the dribbler and go over. Jump out to stop the ball and go through. Hug the screener and go under. Jump and trap the dribbler early before the screen can be set. Defend the roll man with a big-to-big rotation. Note: On the weak side make sure to cover the top, elbow, and box. 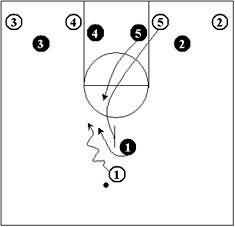 Switch pick and roll - you can always switch equal size players. Short-clock situations - switch regardless of size. 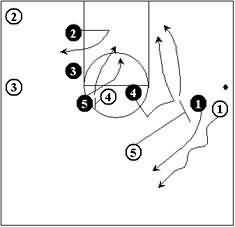 I think the most difficult play to defend in all of basketball is the Pick and Roll. Here are some options to defend against the Pick and Roll. X1 fights over the screen. 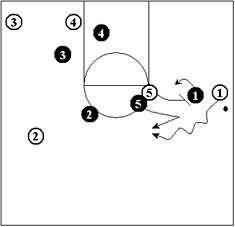 01 dribbles to the elbow for a shot or passes to 02 at wing. 05 rolls to the basket. Rotation: X5 helps and recovers then quickly picks up 05. Weakside players help and recover and stay with their individual opponents. X1 and X5 trap 01. 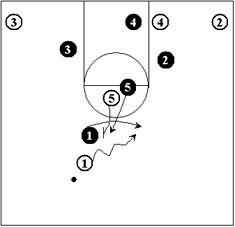 01 reverses the ball to 05. 05 reverse the ball to 01 and down screens for 03. X5 steps back and lets X3 go through the screen to assume a denial position against 03. X2 takes 02 at wing. When 05 sets a screen for 01. X5 hugs 05 and allows X1 to cut behind him. The "HUG" is another option to help X1 get back quickly to 01. X5 steps back and lets X1 to go through. 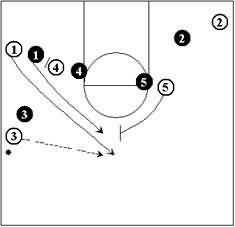 X4 zone up and stop 01 to go all the way to the basket. If 04 rolls to the basket X4 takes him. X3 goes over the screen to deny the ball. X1 goes under the screen. Note: On the screen-rescreen the dribbler's defender goes over the first screen. On the rescreen he goes under. Typically the second screen is solid, so X5 zones up and plays centerfield to prevent 05 from rolling to the basket and/or stops 01 from shooting or penetrating. Also X5 can trap 01 with X1. X4 stops 01 at elbow. 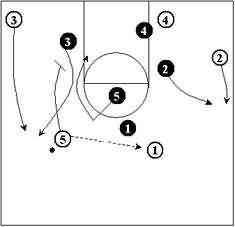 Rotation: 01 reverses the ball to 04. 04 is an excellent shooter. X4 rotates to 04 and contests the shot. X1 stays with 01 by denying the pass. 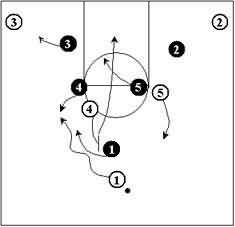 Players X2 and X3 assume a pass denial against 02 and 03. 01 is a good shooter. X1 fights over the screen and traps 01 with X4. 04 rolls to the basket and X5 rotates to pick up 04. X4 closes out against 05. X2 assumes a pass denial against 02. 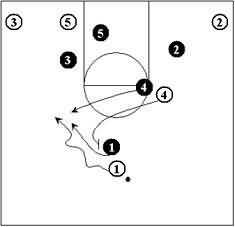 Player 04 inbounds the ball to 01. 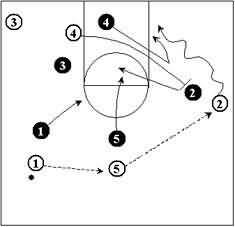 01 dribbles up the court and passes to 03 at wing then cuts to the ballside corner. 04 sets a pick for 01. 03 reverse pass to 01 at top of the key. Quickly, 05 comes out to ball screen for 01. Note: 01 likes to penetrate to the basket. 01 goes all the way to the basket. 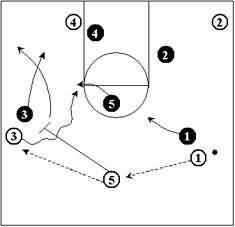 X5 follows 01 to the basket to block the shot. X2 helps and recovers to 02. X4 assumes a pass denial against 04. 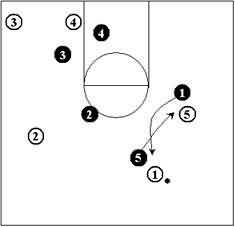 05 inbounds the ball to 01. 01 advances up the court. 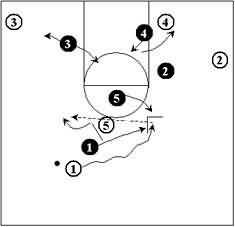 05 ball-screens for 01 at top of the key. 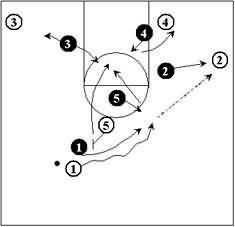 01 reverses the ball to 05 at top of the key. 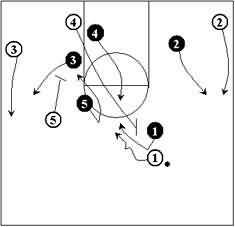 05 passes to 03 then ball screens 03 and rolls to the wing. 03 drives to the elbow for a shot. X5 closes-out against 03 to contest the shot. X1 must go over the screen to prevent 01 from shooting or penetrating. X5 zones up to stop 01 and if 05 rolls to the basket X5 quickly takes 05. X2 and X3 stay with their opponents by denying the ball. Note: When the clock is running out, you can switch regardless of size or trap. X5 hedge and recovers and rotates against 04. 05 back-screens 01 and rolls to the basket. X2 shows and recovers against 01. 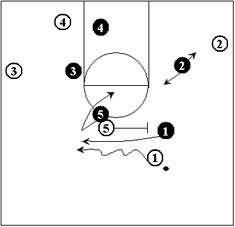 05 ball screens for 01 and fades toward the ballside wing. X5 hedge and recovers against 05. 05 sets a solid screen against X1. 01 dribbles over the top. X5 switches with X1 and pushes 01 uphill. Note: Communication is a must in this situation, X5 has to shout saying "Switch". X5 switches again by taking 05 and X1 back to 01. Note: Make sure that X5 pushes 01 away from the three point line to switch with X1. 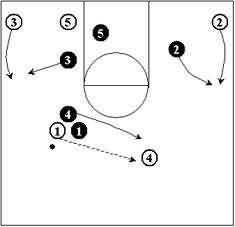 04 back screens X2 and rolls into the lane. 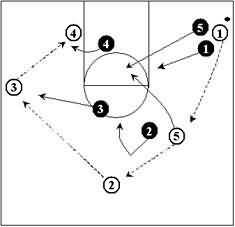 X5 rotates to 04 and X4 stops 02 from going to the basket. 05 back-screens for 01 and rolls to the basket. X2 drops to the middle of the box guarding 02 and 03. X1 and X5 trap 01 at corner. 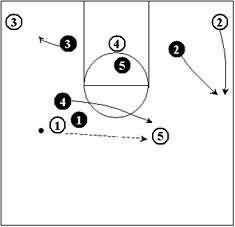 05 back screens for 1 and pops out to the ballside wing. X2 closes out to 05. X3 moves to the top of the key. Rotation:X2 closes out on the pass release against 05. X3 closes out on 03. X4 fronts 04 at low post. 04 sets a pick against X5. X4 switches with X5 and takes 05. X1 goes over the screen and pushes 01 up the hill. X5 takes 04 inside the box. with Matthew Driscoll, University of North Florida Head Coach; 2015 Atlantic Sun Champions; 2015 Atlantic Sun Coach of the Year. 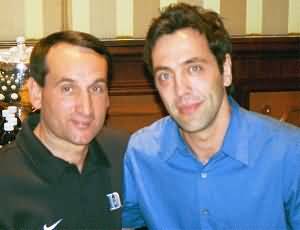 with Ray Giacoletti, former Drake University Head Coach; former Assistant Coach at Gonzaga.